Nearly one in every three Americans will suffer from an anxiety disorder at some time during their lives. Dr. Stanley Hibbs offers the tools to end this suffering with the Three C's: Calm the Body, Correct the Thinking, and Confront the Fears. 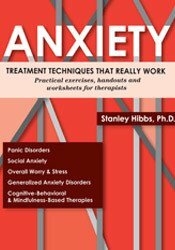 Combining evidence-based treatment approaches and 30 years of clinical experience, Dr. Stan Hibbs has assembled a collection of his most effective anxiety treatments. Concise, clear and practical, all the tools you need to motivate, encourage and effectively treat your anxious clients. A passion for treating anxiety has focused Stanley Hibbs, Ph.D. on a mission ... that no one should suffer with anxiety disorders. Over his 30-year career he has successfully treated thousands of clients with anxiety, using his easy-to-understand explanations and techniques that quickly fuel the road to recovery. Dr. Hibbs has taught his unique anxiety treatment strategies to more than 2,000 mental health professionals. To make the basic principles of anxiety recovery available to as many people as possible, he has written a self-help book, Anxiety Gone: The Three C's of Anxiety Recovery. (Dare 2 Dream, 2007). A licensed clinical psychologist in Georgia, Dr. Hibbs maintains a robust private practice that specializes in anxiety treatment. Prior to private practice, he worked at a community mental health center and drug treatment program for teens, and taught at several colleges. Dr. Hibbs was a regular guest on the daily radio show, "Marriage & Family Today." He is also a trained life coach, and shares life-changing steps in his book, Consider It Done: Ten Prescriptions for Finishing What You Start.